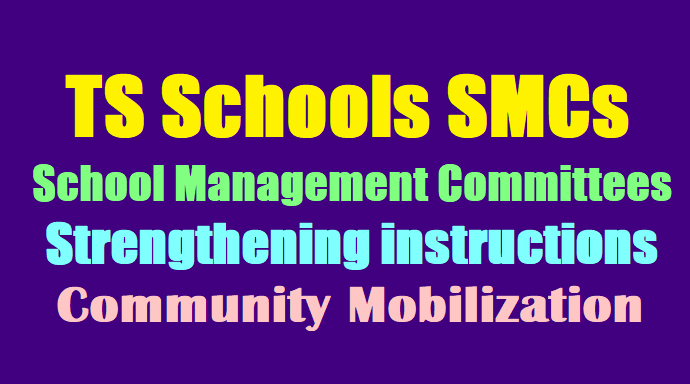 Sub: Telangana SSA, Hyderabad - Community Mobilization - strengthening of the School Management Committees (SMCs) -Certain instructions issued - Regarding. l.This office Proc. Re. No.382/IE/T8/TSSA/2016, Dated: 11.01.2017. 2. This office Proc. Re. No.382/IE/T8/TSSA/2016, Dated: 25.01.2017. Up loading of the information about SMCs names & Phone Numbers etc in child info website. Down loading best practices from SHAGUN web site. To Form Committees at Mandal and District level. To prepare hand books by involving PR functionaries which is a guiding factor for future interaction. Built up relationship between school & Society effectively. Best practices to be followed in the Schools for improvement of academic standards. To involve Gram Panchayat/ Mandal Parishad in Development of School systems at local level. Modernizing the schools with participation of teachers, SMCs and students.